When you want luxury in your SUV, go with the Platinum trim of the Ford Explorer. 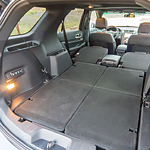 It includes seats upholstered in quilted premium Nirvana leather, a twin-panel moonroof that opens to let in air, and superb music with the 500-watt Audio System from Sony®. The front lights your path brightly and efficiently using low- and high-beam headlamps that rely on LED technology. When the Ford Explorer is properly equipped with the Class III Trailer Tow Package and the 3.5L Ti-VCT engine, it can tow up to 5,000 lbs. To ensure that your haul remains steady, AdvanceTrac® with Roll Stability Control™ uses Trailer Sway Control to brake selected wheels and modifies engine power as needed. Find out what deals you can have for the Ford Explorer by going to Tom Masano Ford Lincoln in Reading, PA and going for a test drive.